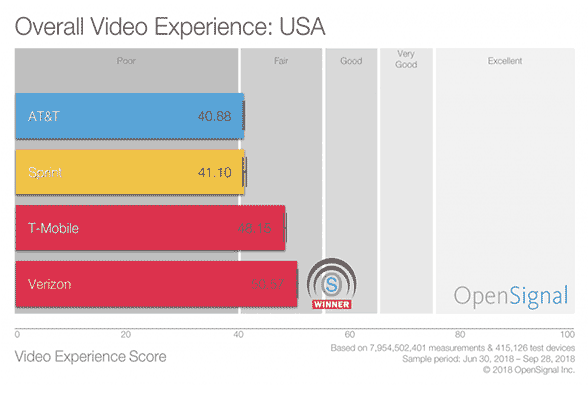 The global report on mobile video experience from analytics company OpenSignal is in. 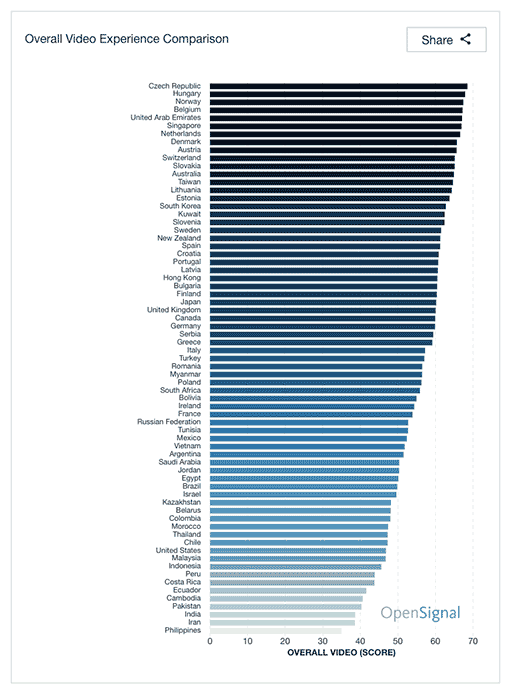 And if there’s one result that we saw first, it’s that the Philippines is at the bottom of the heap — of the 69 countries analyzed from May 14 to August 11 this year, specifically. 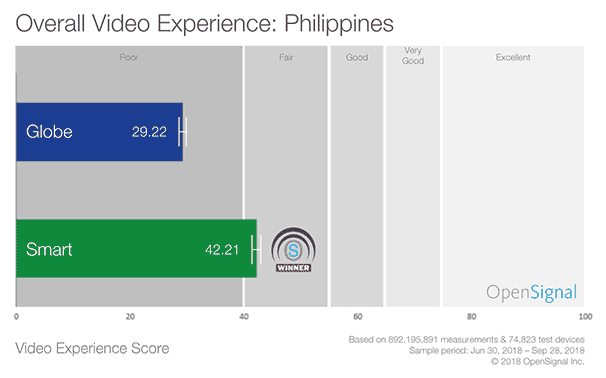 The Philippines scored 34.98 from the video-experience metric OpenSignal derived from an ITU [International Telecommunications Union]-based approach for determining video quality. The score computation takes into account the picture quality, video loading time, and stall rate. An experience score between 75 and 100 is excellent; between 65 and 75, very good; between 55 and 65, good; between 40 and 55, fair; and between 0 and 40, poor. However, the more interesting data we saw was Smart Communications’ score of 42.21. It’s not so much that it’s higher than Globe Telecom’s 29.22. It’s that it’s even better than two U.S. carrier’s respective points — AT&T’s 40.88 and Sprint’s 41.10. 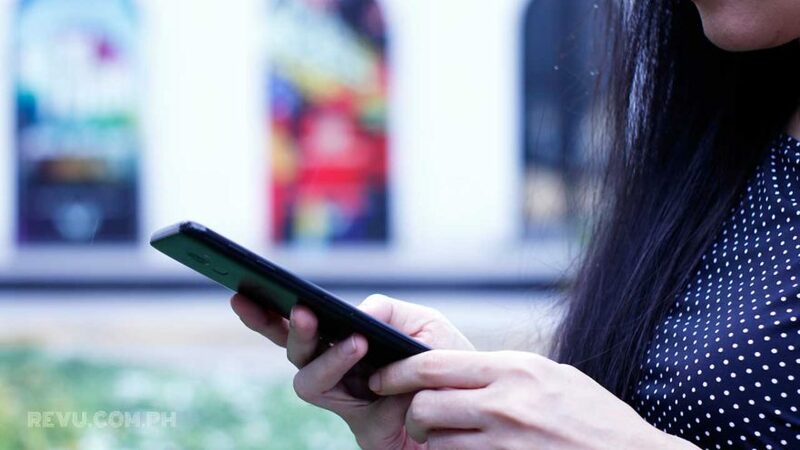 Take note that a fast internet-connection speed doesn’t necessarily translate into better mobile-video streaming, according to OpenSignal. The last time we were in the United States, we used AT&T’s network. And mobile streaming at the time was definitely way better than our experience with any of the telcos in the Philippines. But everything might have changed in 2018. In the country, our mobile video experience when on Smart’s network is about the same as when we are on Globe’s. Again, this is our experience and might be different for you guys. After all, this particular OpenSignal study was based on 892,195,891 measurements and 74,823 devices. Ours is just a mere speck — if our unit (or units?) were even part of it. But let us know your thoughts. Join our poll, or better yet, sound off in the comments below. It would help to let us know where you’re located. Which network has given you a better mobile video experience so far? Not applicable. I've only been on one network. Not applicable. I haven't tried streaming when using mobile data. Visit this page to see the other results of OpenSignal’s report. The one on East Asia can be found here. For the US, check this out.